So, we now have some idea of how the eye works and the role of Vitamin A in sight. Colour blindness is only one of the problems that may occur in the eye, one that has no real solution. So what are some of the solvable eye problems? Viral conjunctivitis usually clears up within a few weeks, while anti-biotic eye drops are used to kill off bacterial infections in the eye. Artificial tears are often used to help prevent the symptoms of allergic conjunctivitis, as they help to dilute any dust or foreign allergy-causing substance in your eye. Anti-histamine pills can also help to control conjunctivitis. Myopia, or short-sightedness, is an eye condition where distant objects appear blurry because light rays are focused to a point in front of the retina. Hyperopia, or long-sightedness, is the corresponding eye condition that makes close objects appear blurry because light rays are focused behind the retina. These conditions are caused either because the cornea is too curved or flat, respectively, or by an unusually shaped eyeball. Traditional methods of dealing with short- and long-sightedness include glasses and contact lenses. In the case of short-sightedness, a concave lens in the glasses is used to move the point where the light converges from the middle of the eye to the retina. In long-sightedness, a convex lens is used to move the focus point of light forward onto the retina rather than behind the eye. Specially trained eye surgeons are now able to use laser technology to re-shape the cornea of the eye. This removes the need for corrective glasses or contact lenses. A cataract is when the lens of the eye becomes cloudy. A cloudy lens prevents light from going through the lens to the retina and so blindness ultimately results. According to the World Health Organisation cataracts are the leading cause of blindness, being responsible for 48% of blindness in the world. Most cataracts are caused by aging. Because the lens in the eye is made up of mainly protein and water, as it ages the carefully-arranged proteins can clump together, clouding the lens. Occasionally children are born with a cataract or one may develop after eye injury, inflammation or some other eye disease. Cataracts are treated by surgery to remove the clouded lens and replace it with a synthetic one. This synthetic lens can be concave or convex in order to fix short- or long-sightedness at the same time as restoring sight. Understanding better how the eye works, from both a biological and chemical perspective, has led to important discoveries about how to improve night vision and prevent blindness. Eye conditions such as conjunctivitis, short-and long-sightednesss and cataracts can be successfully treated using a variety of methods. Vitamin A is now deliberately added to food while lens and laser surgery are restoring sight. Retinal, one of the parts of rhodopsin, is a special form of Vitamin A. One of the sources of Vitamin A in our diet is carrots so there is a strong belief that eating carrots will help you see better in the dark. Retinal is essential for the functioning of the eye, in particular the rods in the eye. 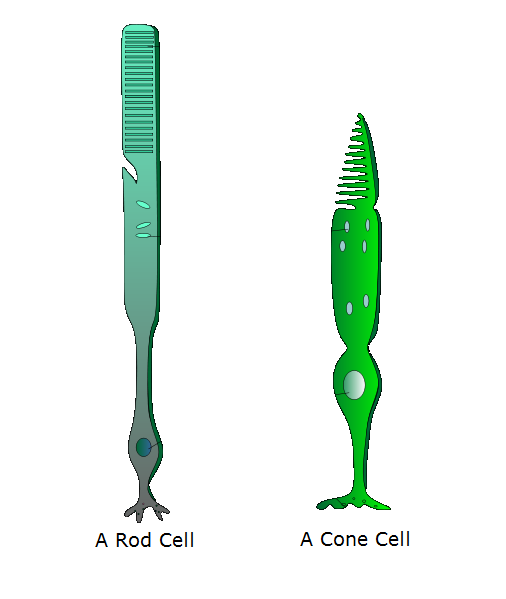 Rods provide black and white vision and respond in dim light, while cones provide colour vision and respond to bright light. During the day, the incoming light is strong enough that what little retinal is around will be activated to start the process of vision. At night, when there is a lack of retinal, it becomes difficult for the rods to sense the small amount of light around and this results in poor night vision. Geneticist Phillip Simon and horticulturalist Clinton Peters at the University of Wisconsin have developed a new variety of carrot called the Beta III. 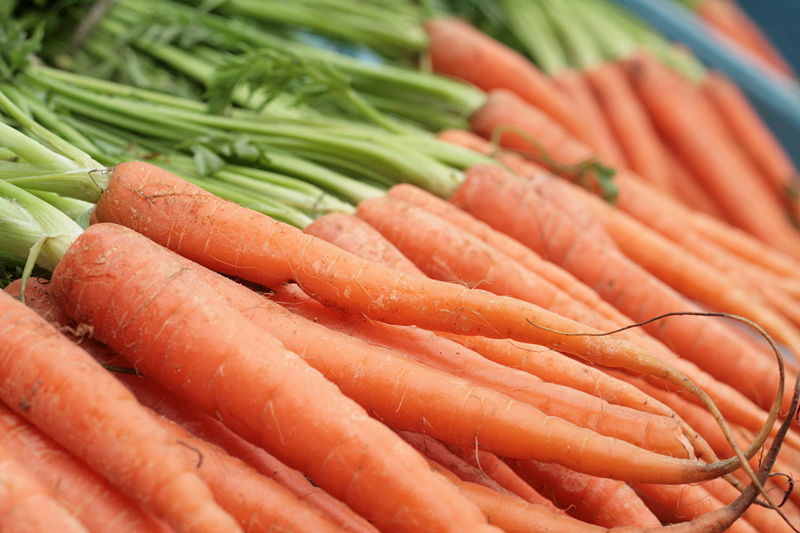 This ‘supercarrot’ contains three to five times the concentration of Vitamin A in normal carrots. This Beta III carrot is designed to combat the blindness caused in developing countries by a lack of Vitamin A. “Worldwide each year Vitamin A deficiency causes 10 million cases of night blindness and one million cases of cloudy vision.” Dr Phillip Simon. However, lack of Vitamin A in your diet not only affects night vision, but can cause poor immune responses and has been linked to anaemia. Good sources of Vitamin A include green leafy plants, yellow fruits such as golden mangoes, palm oils and of course carrots. Other foods that have been artificially fortified with Vitamin A include margarine, wheat, rice, edible oils, and sugar. The idea that carrots help you to see in the dark was promoted by Britain’s Air Ministry during World War II. This tale served a two-fold purpose. Firstly, it prompted people to eat more home-grown vegetables when few other food supplies were available. But the main purpose was to disguise Britain’s new and secret Airborne Interception Radar technology, used to target enemy bombers before they reached the English Channel. Britain’s increased success was attributed by both the public and the enemy to increased carrot consumption by British pilots, rather than new technology developments. Remember how cones in the eye are responsible for colour vision? Colour blindness is caused by a problem with blue, red or green light-receptive cone cells in the eye. The spectrum of colours that we see is made up of different amounts of blue, red and green light. If for example the green light-sensitive cones in the eye do not work properly, it is difficult to tell the difference between colours such as oranges, greens, browns and pale reds. 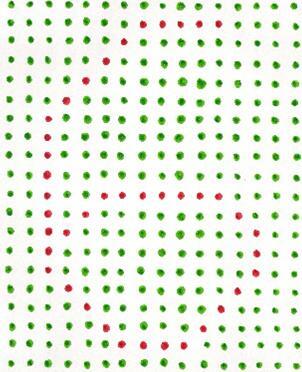 A Red-Green colour blind person would not be able to see the number 6 in this picture. Some people suffer from a rare eye condition called monochromatism, where a person only sees in black, white and grey. Side effect or taking some drugs or medication. Colour blindness is usually untreatable. We all have some understanding of the importance of the eye. We rely on sight every day. Studying the eye can help us understand the basis of eye problems such as conjunctivitis, colour blindness, and cataracts. It’s a fascinating topic to learn more about. Light enters the eye through the pupil (part of the iris) and is focused onto the fovea (focal point) through a combination effort between the cornea and the lens. The cornea acts as an ‘outer lens’ and bends incoming light onto the lens. The lens then refocuses this light onto the first layer of cells in the retina as an upside-down image. Cells in the retina convert the light into a series of electrical impulses that are sent via the optic nerve to the brain. The brain adds all these impulses signals together to re-form the upside-down image and makes sense of it by turning it up the right way. Chemistry is a crucial part of the third step, where the retinal image is broken down into neural signals that are sent to the brain. The retina is made up of several layers of cells: a layer of ganglion cells (which make up the optic nerve), a layer of neural cells and a layer of rods and cones. Light must first travel to the rods and cones at the back of the retina, where some really interesting chemistry takes place to break the image into electrical impulses. These impulses are then transmitted to the neural cells, then to the optic nerve and the brain. This process is called phototransduction. There are some 120 million rods and 6 million cones in the retina. Rods are responsible for night vision, sensitive motion detection and peripheral vision. Cones are responsible for colour vision. A light sensitive pigment called rhodopsin is found in the rods and cones. Rhodopsin is made up of one of several types of opsin proteins and a small molecule called retinal, chemically bound together. The different types of opsin proteins are designed to detect, among other things, different wavelengths of light and so allow us to see in colour. Light hitting a molecule of rhodopsin causes isomerisation (a change in shape) of the pigment as it gains energy. This energy-rich rhodopsin molecule then transfers energy to neural cells, which causes them to start an electrical impulse that travels along the optic nerve to the brain to paint a very small part of a large picture. 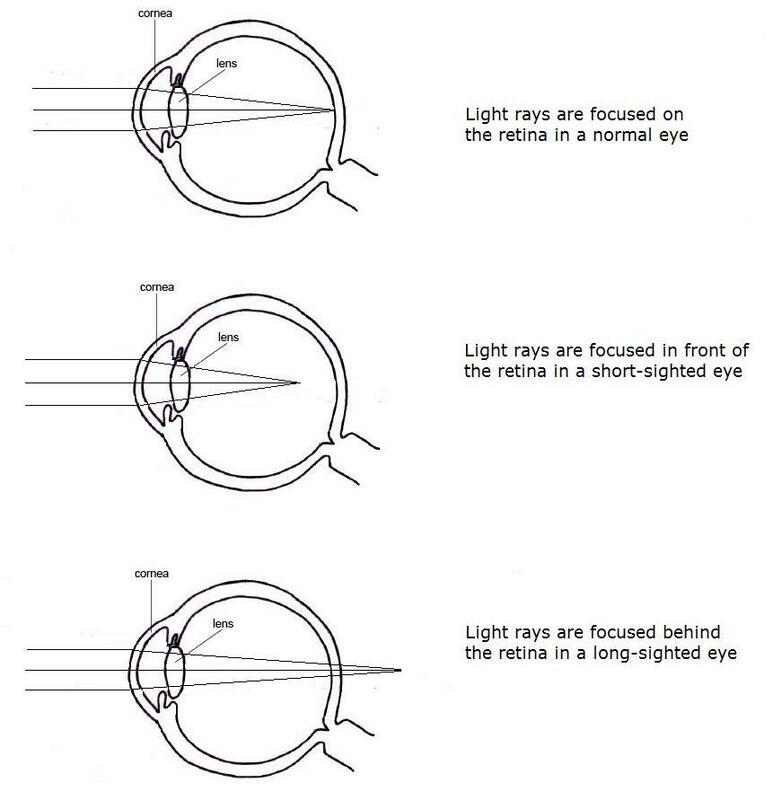 This process occurs in the millions of rod and cone cells in the retina, resulting in information about an overall image being sent to the brain. Meanwhile, the excited rhodopsin molecule has lost its extra energy and splits into its two parts of opsin and chemically changed retinal. A complicated chemical process then regenerates the original retinal molecule and joins it back to the opsin protein to make rhodopsin again.